Ray ‘Reggie’ Betts wins the Saints Open with 33 Stapleford Points. Ex-Saint and guest of honour Michael ‘Mick’ Earls presents the shield. Peter ‘Rat’ Rattue is obviously stunned that Reg beat him! The sun shone, the Southampton City Golf Course unfurled its finest greenery and a dozen golfers of varying competence chomped on bacon baps and drank tea, coffee or, for those needing to steady their nerves, something stronger before the start of the LSSC 16th Annual Open Golf Tournament. The date of the tournament, normally played the day prior to the season’s last home game, was moved to the day before the Man City home game, and then moved again as that fixture’s date changed for the demands of TV. John Quinn needing resuscitation after learning he was second with a scratchy 30 points. A number of last minute withdrawals reduced the field but it was made a respectable size by Southampton-based family and friends playing in, what is, after all, an Open. And to ensure everyone, regardless of ability, has a decent game, the scoring is Stapleford Points, which uses an individual handicap but means that one or two bad holes doesn’t have to ruin the whole day! Sheena Quinn, Mike Earls and Rat are joint fourth on 26 points. 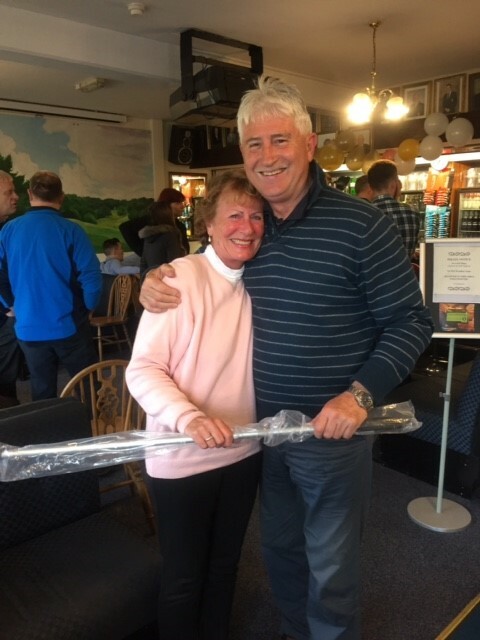 Ex-Saints player and keen golfer Michael ‘Mick’ Earls was the guest of honour and he and his wife, Irene, not only played a round with the LSSC contingent but insisted on paying for their rounds of golf and hospitality! As always in these events there were many stories from the day’s round recounted in the club house afterwards: Sheena Quinn believed she had her name on the Longest Drive prize until Paul ‘Wath’ Wathan, in the final group, hit ‘the best, longest shot I’ve ever played in my life’ with a giant strike on the 18th. 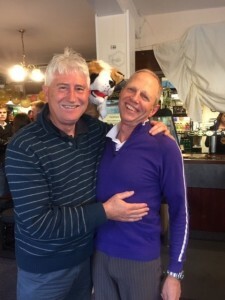 John Quinn was convinced that playing partner and Southampton based Saints’ fan Chris Paddock had hit a hole-in-one on the par three 10th hole, when his ball hit the green, spun backwards and disappeared from view. John shouted at Bella, Chris’s wife, who was playing in the same foursome, that she had just missed a hole-in-one. With that she gave John a huge kiss and hug. When she eventually finished John sheepishly informed her that it wasn’t him who had hit the shot, but was Chris! It was then Chris’ turn for the kiss and hug! Only when they approached the green that the group realised that Bella’s passion, whilst greatly appreciated, had been misplaced. 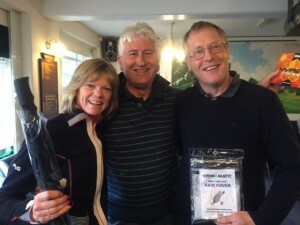 They saw Chris’ ball hidden on the green – there was no hole-in-one after all! Halfway round the golfers were joined by another ex-Saint, Roger Fry, who had docked from a cruise holiday that morning but still managed to get to the tournament to lend his support. Bella Paddock presented with a golf ball retriever and cup for the highest placed non-LSSC member. Her 29 points made her third overall. During the afternoon the weather changed from shirt-sleeve order to wet-weather gear as a couple of showers passed over and the wind increased, but after the game everyone declared they had enjoyed themselves. The players enjoyed a light meal at Bowlers, the ‘muni’s,’ as the course is still known locally, restaurant. John formerly introduced Michael Earls to the group, recalling his successful career with Saints and Aldershot, and being called into the full Republic of Ireland squad by Johnny Giles, before being forced to retire through injury prematurely at the age of 26. 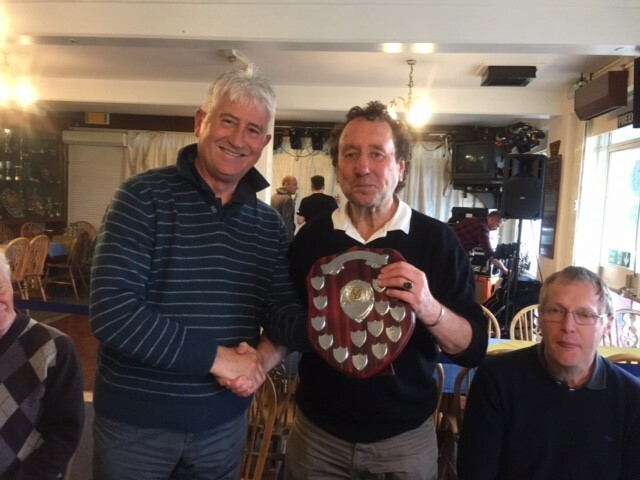 Mike presented the prizes and there was not a prouder man in Hampshire than Ray ‘Reggie’ Betts when he was named as the winner of The 2016 Open with a score of 33 points. Reg, despite years and years of trying, had never won the title, although his name is on the club’s other annual golfing trophy, the LSSC Masters. 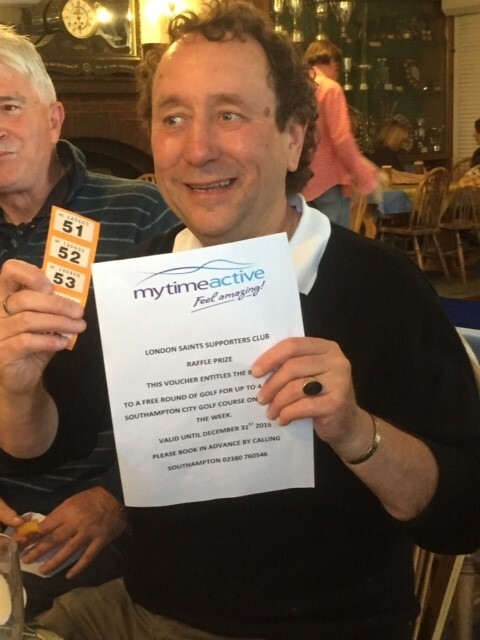 Not content with The Open, Reg also scooped the raffle prize: a round of golf for four people at the same course, generously donated by MyTimeGolf, who operate the course, and Mark Robbins, the club professional. Second was the organiser, John Quinn, with 30 points, and who also won nearest the pin on the 17th par 3. He did not collect a prize for the nearest the pin as his shot, although on the green, was still some 30 yards from the hole and he felt this did not merit reward! Third overall was Bella, who was also first non-LSSC member, with 29 points. Whether it was the recollection of kissing both John and her husband within seconds, or genuine surprise but Bella not only went bright scarlet when her name was read out but was also reduced to tears! 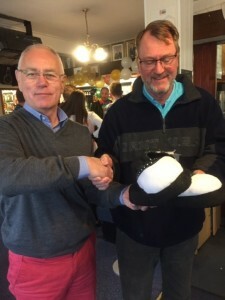 Tied for fourth place were: Sheena Quinn, keeping the Quinn name flying; serial previous winner Peter ‘Rat’ Rattue; and guest of honour Mike Earls, all with 26 points. Despite the late withdrawals and thanks to the usual, generous donation of £50 from the LSSC, the tournament broke even. The next date for golfing diaries is the LSSC Masters, which is being played on Friday, 15th July in Frome, as usual the day before the weekend LSSC cricket tour to the West Country.